Today I will try and explain how to make a double ruffle on a hair-pin frame. This is only one type of ruffle, there are lots of different configurations. I will be making one loop in each stitch. 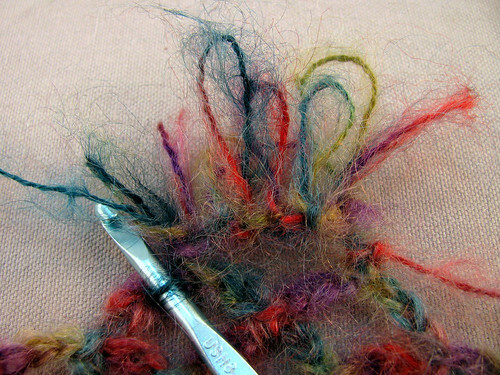 There is a way to make more loops per stitch. Hopefully I will be able to write a more complete tutorial at a later date. Now here is a part I messed up, so if someone is only folowing the photos they will be putting the ruffel on backwards. 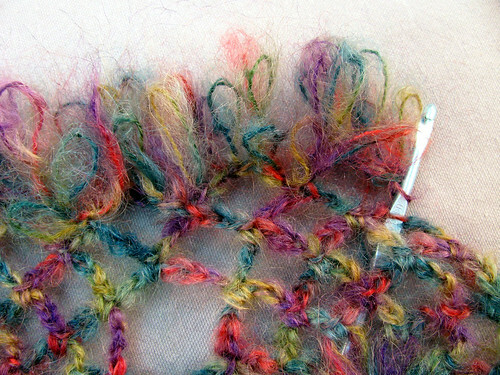 The photo shows a slip stitch being pulled through to the front in the middle stitch of a chain 7 loop. Well, choose any chain 7 loop and take the slip knot off the crochet hook and draw it through from front to back of any middle stitch in that loop. 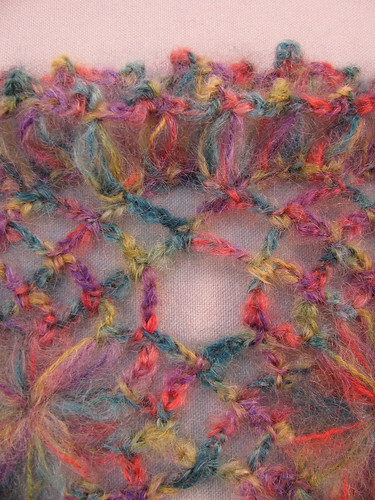 The photo should show the back side or purl side of the crochet. 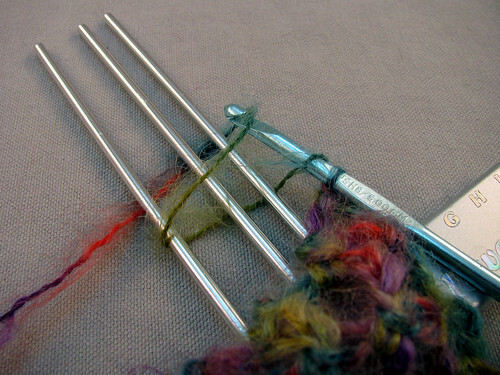 Put 3 pins in the hair-pin frame the top two about one centimeter apart, a half inch is OK too depending on the frame. 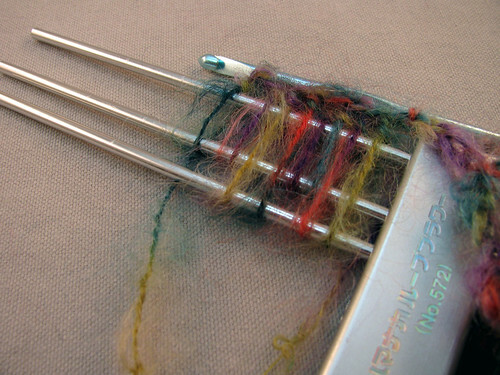 Hold the frame under the crochet piece and wrap the yarn under and over the frame pegs. (I just noticed the next 3 photos are messed up too, it was late and I was pressing to get these photos taken. 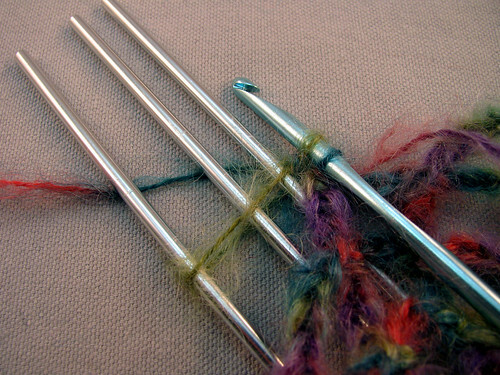 It doesn’t matter at this step anyway because the hairpin-frame can still be turned over before the next stitch.) Again pull a loop under the yarn leading to the stitch on the hook, like was done finishing the last loop of the motif middle. Then complete the single crochet by going through the two loops. Now the next photo shows the right orientation of the hair-pin frame. The one centimeter apart pegs pointing down towards the work. It is really hard to get oriented here, since the ruffle will be pointing up. The technique is actually upside down and backwards from the finished ruffle. ( Add to that the directions were all in Japanese, so I only figured this out by actually playing around with everything.) So now we keep making loops, two long, two short, two long, two short, a total of 8 stitches holding 8 loops. 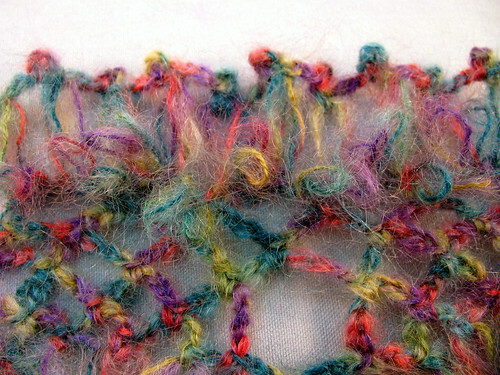 The next photo should show the purl loops of the shawl, see the purl loops attached under all the loops. This is the back side of the ruffle so you want it on the back side of the shawl. Take the hairpin-frame out of the loops. Take the hook out of the last loop and then put it in the middle stitch of the next chain 7 loop and put the stitch back on the crochet hook and pull through. I like this better than doing a slip stitch. I think a slip stitch adds a space between loops that is unnecessary. There is probably a term for doing this and I will try to learn it before I try and write anymore tutorials. Keep making the 8 loops (2 long, 2 short, 2 long. 2 short) and attaching them to the center chain of each 7 chain loop. The next photo now shows the right side of the work with the stitch on the hook being drawn to the back. I did not go around the whole sample. I just went far enough for a photo. 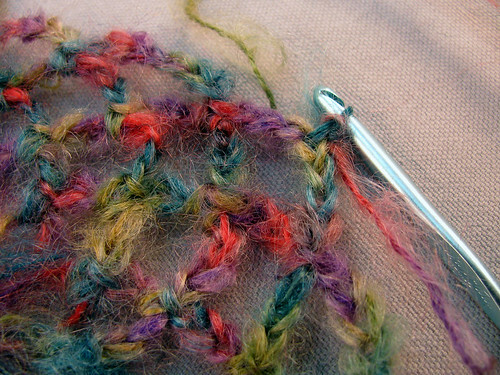 After finishing all the loops finish the ends as you normally would with any crochet piece (knot, etc.) and weave in. Now comes another fun part. 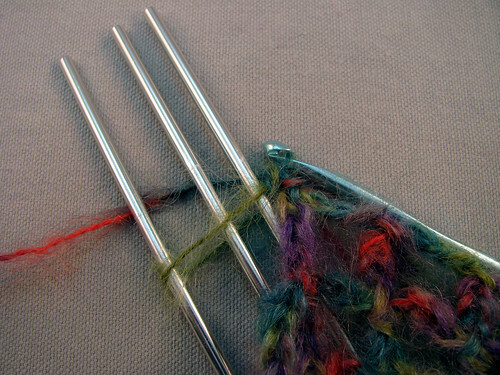 You can use any yarn to finish the ends of the loops. I am using the same yarn and matching the ruffle to the motifs in the middle. So I single crochet the first two long loops together and put a 3 stitch picot on top and chain 3. Then repeat across, only crocheting the long loops together in groups of 2 with a picot on top and 3 chains in between. As you can see by varying the amount of chains you control the fullness of the ruffle. Now do the same thing with the short loops. 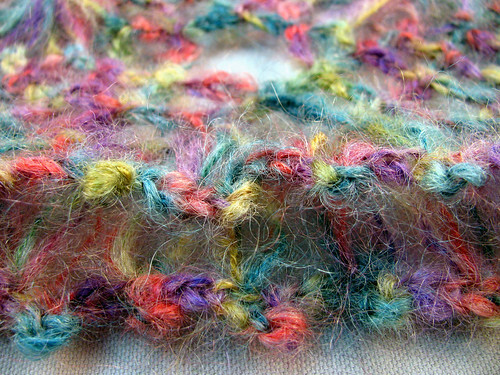 Crochet two short loops together with a picot on top and three chains in between across the whole ruffle. Knot and finish off the ends as you normally would. The next two photos show the two layers of crochet ruffle edging. The first one has the right color. The second is a little on the pink side, but was the best showing the ruffle laying flat. This is the first tutorial I have ever tried to write. I know it is incomplete. It was a learning experience and I hope to produce a better one in the future. Practice in writing is the same as practice in crochet. One can only get better by doing it; I hope to get better by blogging. This entry was posted on Friday, December 19th, 2008 at 3:00 am and is filed under Crochet and Lace. Tagged: Crochet, Hairpin lace, Lace. You can feed this entry. You can leave a response, or trackback from your own site. Thanks very much for this tutorial. I am just now learning hairpin lace and didn’t know I could use the fork to make motifs. This is versatile and very pretty!